Insulin signaling is not impaired in hep-barr2–KO mice. (A) i.p. ITT. Data are shown as mean ± SEM (n = 9 mice per group, 20-week-old males). 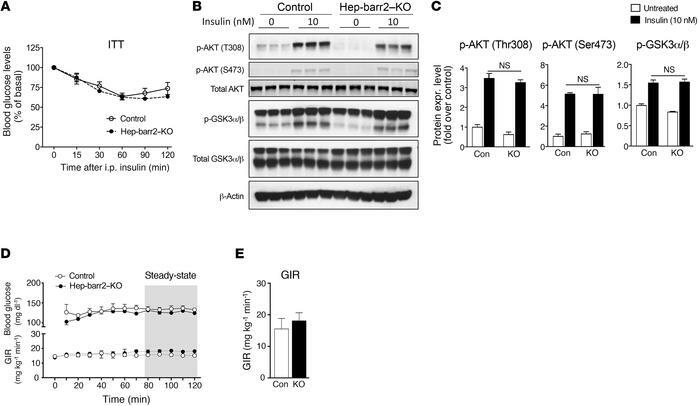 (B) Insulin-induced phosphorylation of AKT and GSK3α/β remains unaffected by the lack of β-arrestin 2 in hepatocytes. Primary hepatocytes prepared from hep-barr2–KO and control mice were incubated with insulin (10 nM) or saline for 15 minutes. Cell lysates were used for immunoblotting with the indicated antibodies. Representative blots are shown. See complete unedited blots in the supplemental material. (C) Quantification via densitometry (NIH ImageJ software) of the immunoblotting data shown in B. Phospho-protein expression levels were normalized by total AKT or total GSK3α/β expression, respectively. Data represent mean ± SEM (n = 5 mice per group, 16- to 20-week-old males). (D and E). Hyperinsulinemic euglycemic clamp studies. In D, the time course of blood glucose and GIR are shown. Data in panel E were obtained during the steady-state period of the clamp (gray area in D). Values are shown as mean ± SEM (n = 3 or 4 mice per group, 20-week-old males).